On December 12, 2003, President Bush signed landmark legislation providing multi-year appropriations for airports and aviation. Equally important, Vision 100 makes several major changes in the laws on airport development and aircraft noise and emissions. Several of these changes are sure to have lasting and profound effects on the legal rights of airport proprietors and surrounding communities. Although the legislation is exceedingly broad in scope, the following is a brief summary of a few particularly noteworthy amendments that are likely to have far-reaching legal implications. The Act imposes specific requirements for environmental review of capacity enhancement projects at congested airports and designated safety and security projects. Congested airports are defined with reference to an FAA study on airport demand and capacity and include thirty-four airports — virtually all of the large, busy hub airports in the country. Safety and security projects subject to the Act’s provisions are those designated expressly by the FAA Administrator. The Act requires federal agencies with jurisdiction over a project to conduct their review and issue approvals and permits concurrently and expeditiously (within a time period established by the Department of Transportation). The Act also delegates lead agency authority to the FAA for preparation of EISs. Other federal agencies are required to defer to the FAA on (i) the scope of the environmental review, (ii) the statement of purpose and need, and (iii) project alternatives. State governors can elect to participate in the federal environmental review process for affected projects but are not required to do so. The Act dramatically alters current law and practice on environmental review. The Act is designed to reduce the current time involved in conducting environmental review and issuing approvals and permits, which currently take several years and often vary between agencies. Equally important, the Act limits the legal authority of other federal agencies with responsibility over affected resources to exercise independent judgment and analysis of a proposed project. It remains to be seen whether and how other federal agencies will be able to comply with the Act while satisfying their own agency missions and statutory mandates. The Act prohibits the FAA from approving a Part 150 Noise Compatibility Program that includes any measure requiring federal grant funding to address noise in areas exposed to less than DNL 65 dB. This provision essentially means that airport proprietors will not be able to use Airport Improvement Program funding for sound insulation, land acquisition or other noise abatement and mitigation measures in areas exposed to noise less than DNL 65 dB. The FAA has issued an opinion indicating that the provision will not affect existing Noise Compatibility Programs and will not prohibit airport proprietors from using Passenger Facility Charges and other airport revenue to fund such measures. This provision was inserted into the legislation at the request of Sen. Trent Lott to prevent implementation of a noise program at Minneapolis-St. Paul International Airport. While its effect at that airport remains unclear, the language is important. It represents the first time that Congress or the FAA has attempted to use the DNL 65 dB threshold as a legal standard; historically DNL 65 dB reflected only an FAA guideline on what the agency considers to constitute significant noise exposure. The precise effects of this provision on Part 150 studies remain to be seen. It is likely that airport proprietors and noise consultants will be inclined to omit any reference to the DNL 60 dB contour (and below) in Noise Exposure Maps and Noise Compatibility Programs for fear that the FAA will reject both the Noise Exposure Map and Noise Compatibility Program under this provision. The Act amends the aviation statutes to require that virtually all challenges to final decisions by either the FAA or TSA be brought in the U.S. Court of Appeals. 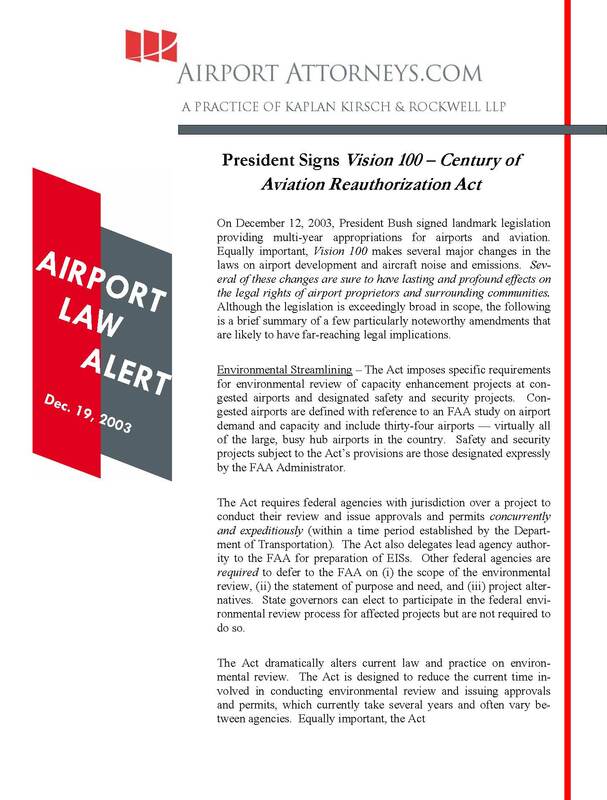 Several courts had interpreted the prior version of the statute to permit challenges in U.S. District Court for certain decisions, including approvals of airport expansion projects. There is some empirical evidence to suggest that past challenges to FAA decisions were more successful in district courts than in the courts of appeal, which may be based at least in part on district court judges’ greater willingness to scrutinize the factual record underlying administrative agency decisions. Consequently, this provision may have the effect of making it more difficult to overturn FAA and TSA decisions approving airport development projects. The Act contains a provision that, without referring specifically to any particular airport proprietor or airport, is designed to permit Teton County to ban Stage 2 aircraft operations at the Jackson Hole Airport without first complying with the Airport Noise and Capacity Act of 1990 or the Part 161 regulations. This provision circumvents the FAA review process under ANCA and Part 161, which the FAA has used in the past at the Naples Airport and elsewhere to limit the adoption of Stage 2 aircraft restrictions. This exemption represents the first time that Congress has granted a statutory exemption to ANCA and may well open the door for other airports to seek similar airport-specific legislative relief. On December 1, 2003, the FAA proposed to revise Federal Aviation Regulation Part 36 to adopt a Stage 4 noise standard. The proposed rule would require that all aircraft type certification applications submitted on and after January 1, 2006, demonstrate that the aircraft meets Stage 4 noise levels. The proposed rule also provides a mechanism for recertifying Stage 3 aircraft if they meet Stage 4 noise levels. Stage 4 noise level is defined as 10 dB lower than the Stage 3 noise level; however, the noise reduction can be achieved by adding reductions at any of the three noise measurement locations (takeoff, sideline and arrival). In its Notice of Proposed Rulemaking, the FAA indicated that most currently produced aircraft types can be manufactured in a configuration that meets Stage 4 noise levels. The FAA accordingly concluded that “the proposed rule would have minimal, if any, cost.” In light of this conclusion, the obvious question for many airport proprietors and surrounding communities is whether the Stage 4 noise rule will provide any material benefit in terms of noise exposure. The proposed Stage 4 noise standard parallels the new standard adopted by the International Civil Aviation Organization (ICAO) and reflects a compromise between U.S. interests—who favored a standard that all current production aircraft could meet—and European interests who favored a more stringent standard. The FAA also stated explicitly in the NPRM that the Stage 4 noise rule would not affect currently certificated aircraft and would not be followed (at least in the short term) by any federal restrictions on Stage 3 aircraft. Unlike when the prior standards were issued, the FAA has not proposed a phase-out of aircraft that meet only the Stage 3 standard. It nevertheless remains to be seen whether and how the Stage 4 noise rule would affect proposed restrictions by airport proprietors on remaining Stage 2 aircraft weighing less than 75,000 pounds and Stage 3 aircraft. Comments on the proposed regulation are due by March 1, 2004. On October 1, 2003, the Working Group on security at general aviation airports submitted its report containing findings and recommendations on improving general aviation security. The report summarized the various actions taken by the federal government, airport proprietors and general aviation industry groups to address security after the September 11, 2001, terrorist attacks. The report also contains numerous recommendations to airport proprietors in addressing general aviation security. The recommendations reflect the Working Group’s view on the need for flexibility in addressing general aviation security to respond to different circumstances at different airports. The lack of uniform regulations nevertheless presents challenges for operators of general aviation airports looking for guidance on the limits of their authority to address security. There already has been some opposition from general aviation industry groups and airport users objecting to security initiatives by airport proprietors and local governments. This uncertainty undoubtedly will continue as proprietors look to fill the gaps left by current regulations and adopt a security program that meets local needs.